As you may have heard, there are some big changes brewing in the world of recycling. China is the world’s largest importer of post-consumer plastics and paper, but in July 2017 the country announced this will be coming to an end. The Chinese government’s decision appears to be the next phase in a series of changes that started back in 2013, when they began taking steps to reduce the amount of imported recyclables they accepted. The decision was informed by a variety of things, including a desire to develop their own domestic recycling program and poor quality of materials received through import. The decision goes into effect as of January 2018 and the short notice has caused a ripple effect through global recycling markets, as states and countries hurry to develop strategies and solutions to maintaining their recycling programs. The Oregon DEQ is encouraging folks to continue recycling whenever possible and to follow proper recycling practices. With the impending changes it seems like we should focus on the reduce and reuse portions of the “Reduce, Reuse, Recycle” mantra. It can be hard breaking old habits, but we want to help in whatever ways we can! We usually have boxes available by the register for folks to pack their groceries into. This gives boxes that would otherwise be recycled a new purpose, and helps us to cut down on the number of paper bags we use. We also offer re-useable tote bags for sale at the registers. They’re both fashionable and environmentally conscious! Buy in bulk! We have a great selection of bulk foods, herbs, spices, and body care products. Buying in bulk helps eliminate unnecessary packaging and waste! Bring in containers from home, or grab one of the re-useable options we’ve got stocked in the bulk isle. We’ve got containers for all your needs from large mason jars, to travel-sized squeeze tubes, to hemp bags! Bring a water bottle! Instead of grabbing another plastic water bottle from the shelves, consider investing in a re-usable bottle. We’ve got a variety of bottles available for sale and are always happy to have folks fill them up at the store! For 14 years we ran a program where community members could bring in containers from home and leave them for other folks to use during their shopping trips. We’ve heard a lot of requests to bring this program back and want to acknowledge them. Unfortunately, the program came to an end because it was against health code and we are unable to restore it at this time. There are several other wonderful programs in the Portland area that enable you to re-purpose, re-home and recycle your unwanted goods. You can find out more about those programs here! 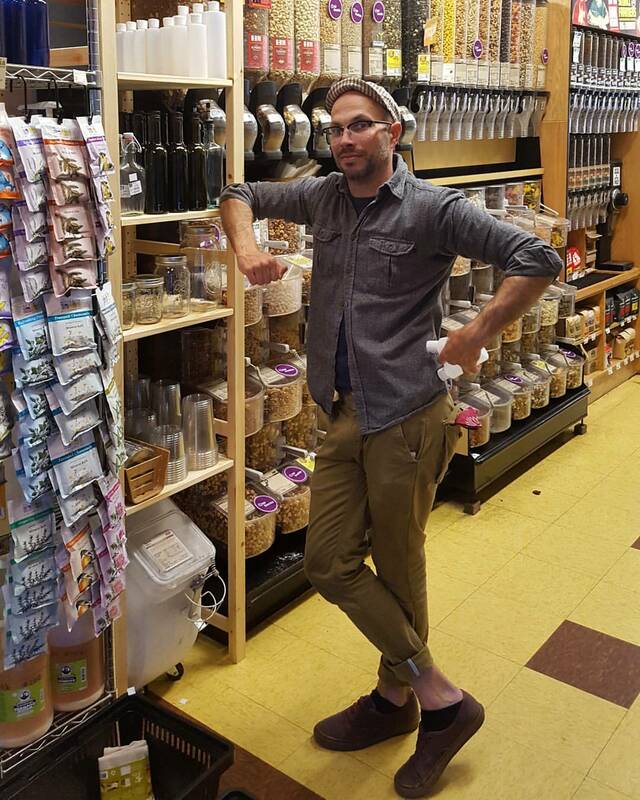 Pictured: Nick setting up the new jar shelf in our bulk department. All of the containers already have their tare weights calculated, so you can just grab, fill, and go!